Wondering which are the best restaurants in Playa del Carmen, Mexico? I just returned from a few months on the Riviera Maya where I had lots of time to explore the food scene up and down the coast. It’s fast-evolving with new restaurants arriving (hello Hermana Republica soon to be arriving in Tulum) and old favourites disappearing (goodbye Los Hijos del la Tostada in their original Colonia Hollywood location). The only constant is that you can’t count on the past — last year’s favourite restaurant can quickly become this year’s disappointment if there’s a change in who’s helming the kitchen. My home base in Playa del Carmen is the Coco Beach neighbourhood in colonia Zazil-Ha. 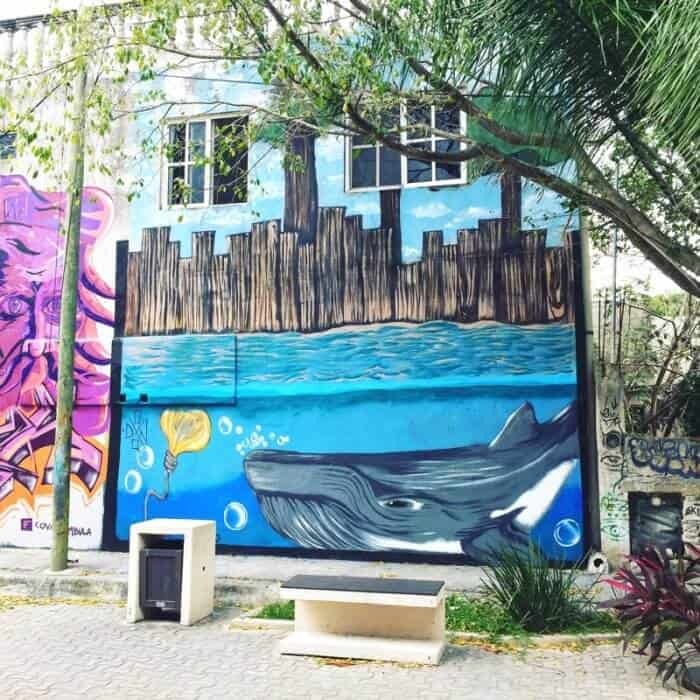 It’s an up and coming zone on the northern edge of town tucked between the beach, the pedestrian walkway on Quinta Avenida or Fifth Avenue, the CTM boulevard and the bike path on 10th. So it’s people-friendly, walkable, quiet and easy to cycle. 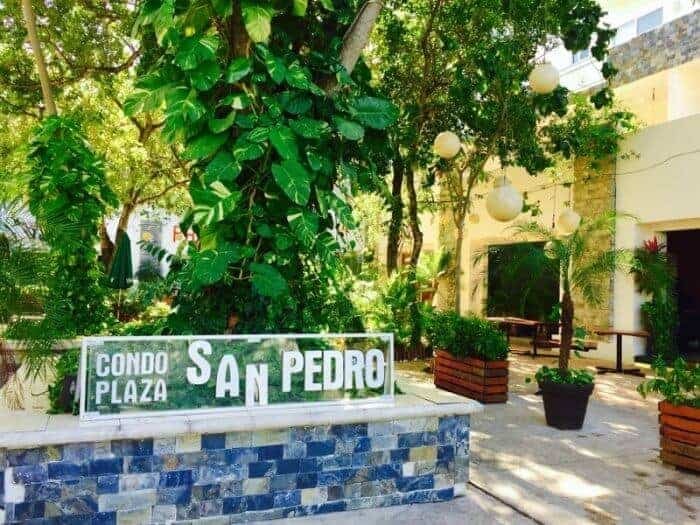 It also happens to be hub central for some of the best places to eat in Playa del Carmen. So, after much arduous research sipping margaritas and eating ceviche, here are my seven favourite places to eat in Playa del Carmen ( in no particular order). Most are near Fifth Avenue and the beach. 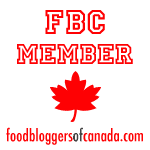 Note that this list doesn’t include tacos stands which deserve their own blog post. You can’t go wrong with El Fogon or Don Sirloin if you’re not sure where to begin. 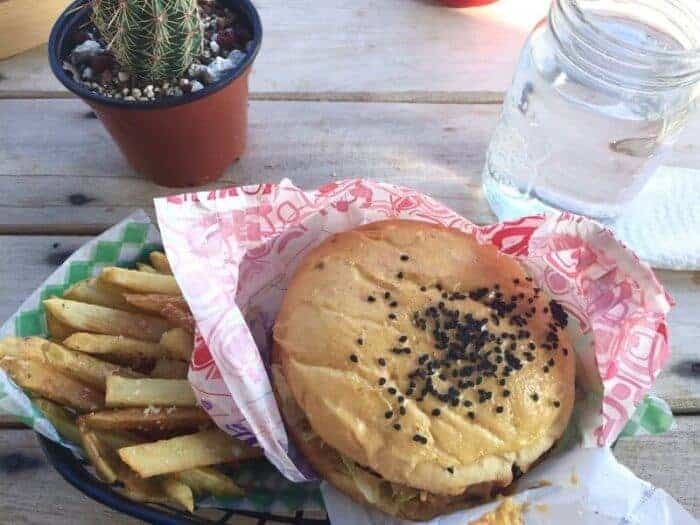 Playa del Carmen seems to be perpetually under construction so I appreciate the “Let’s be Kind to the Planet” philosophy at Marvin’s Burgers, a hub for promoting eco-sustainable eating and living. This is one of the best casual restaurants for fast food. 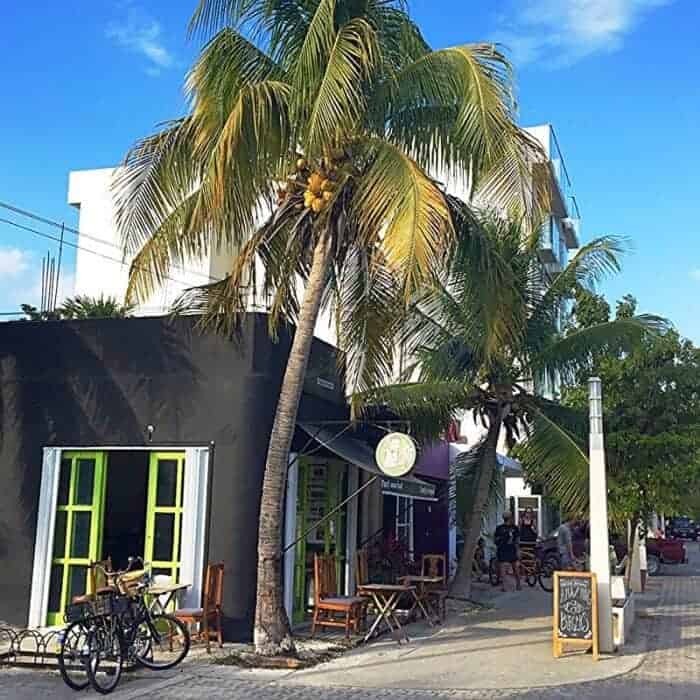 Update: Unfortunately Marvin’s has permanently closed in Playa del Carmen, but check out these other fantastic vegan restaurants in Playa del Carmen for other, good-for-the-planet options for vegan food. This new casual seafood restaurant is a bit tough to find as it’s hidden in the San Pedro plaza off Quinta Avenida between Calle 38 Nte and calle 34 Nte, but it’s worth the hunt. 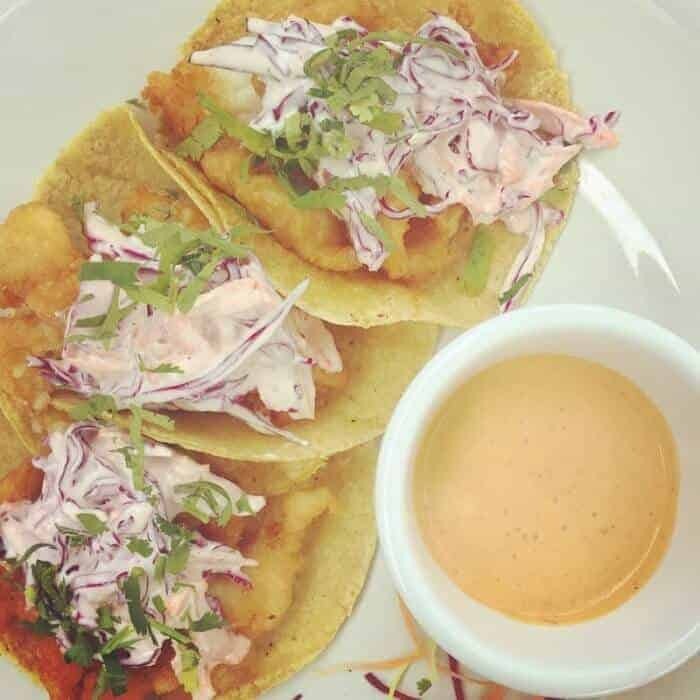 It specializes in street-food from Tijuana and offers a few quiet tables set beneath the trees where you can sip a craft beer and sample fresh-as-can-be seafood. Your best bets are the tostadas such as the house special that’s a tower of fish ceviche on a crispy tortilla. Or try the Fish Zarandeado, a grilled fish specialty from Mexico’s Pacific Coast you won’t find anywhere else in Playa del Carmen. The owners are super friendly, the servers exceptionally helpful and the seafood prepared to order not in advance. I wish I’d eaten there more often. Best known for its budget menu del dia, a vast parade of dishes that begins with an appetizer and bowl of crab soup, el Guero is one of my favourite restaurants for an afternoon snack of ceviche. You get a platter of fresh ceviche with your choice of fish, shrimp or a mix that includes pulpo ( octopus). An added bonus is that the margaritas are icy cold, potent and not too sweet. If you’d like to make your own ceviche, check out our easy recipe for Guatemalan ceviche. 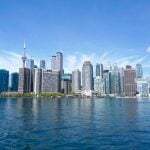 If you’re renting a condo apartment or an AirBnB, chances are you’ll be spending some time at one of the many beach clubs tucked on the sand between Coco Beach and the Cozumel ferry terminal. Many people swear by the Wah Wah Beach Club, but the service was so slow I wasn’t able to get served during the day despite returning several times. I did enjoy a fine thin-crust wood-fired pizza topped with jumbo shrimp on a fine evening when the moon was rising over the water and their live house band was playing retro hits, so I do recommend a visit on Thursday evenings. But for consistently great beach food, I opted for the Lido Club de Playa Beach Club. The grilled shrimp came served with steamed broccoli, zucchini and peppers as well as a basket of potato wedges that were crispy to salty perfection and extra delicious when dipped in the chipotle mayo. Lido Club de Playa Beach Club is also a top choice for families with kids as it offers a play area set in the sand and shade. 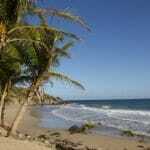 It’s located between Calle 10 Nte and Calle 12 Nte on the beach. Another fine beach club option is the Kool Beach Club on Mamitas Beach. Since I’m often in Playa del Carmen solo, I really appreciate the lockers as I can stash my iPhone, camera and wallet while swimming and not have to worry about my beach bag getting snatched. Kool Beach Club also has a swimming pool which is handy if you’re not a strong swimmer or if the sargasso seaweed has blown into Playa del Carmen and you’re not keen on swimming in muck. 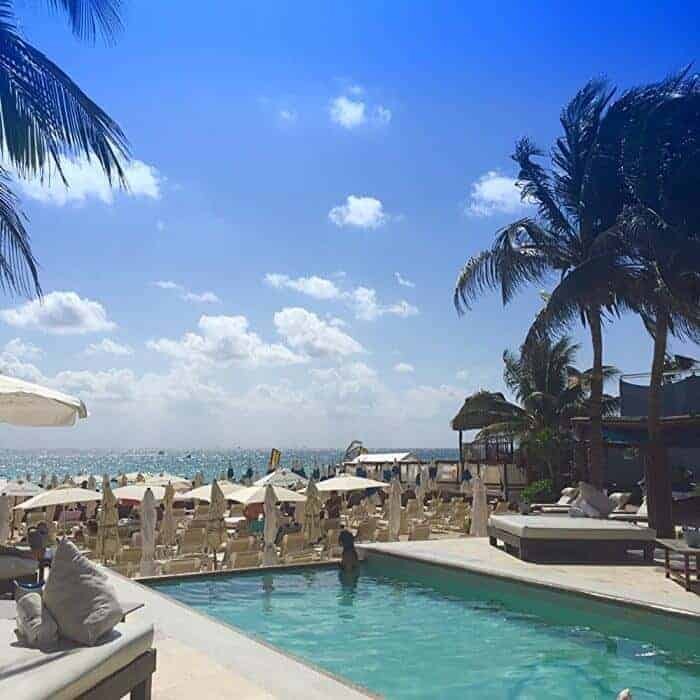 At Kool Beach Club you purchase a day pass for 350-700 MXN pesos (the cost depends on the section of the beach club in which you sit and the type of lounger) and the cost serves as a credit towards your meal. Lucky for me, the budget loungers also happened to be the ones in the shade and near the swimming pool so that worked out just fine as I could get lunch of tacos or a fish filet (comes wth tacos chips and a salad), a few cheladas ( light lager beer with fresh lime juice) and a bottle of water for 350 MXN pesos (around $17 USD). 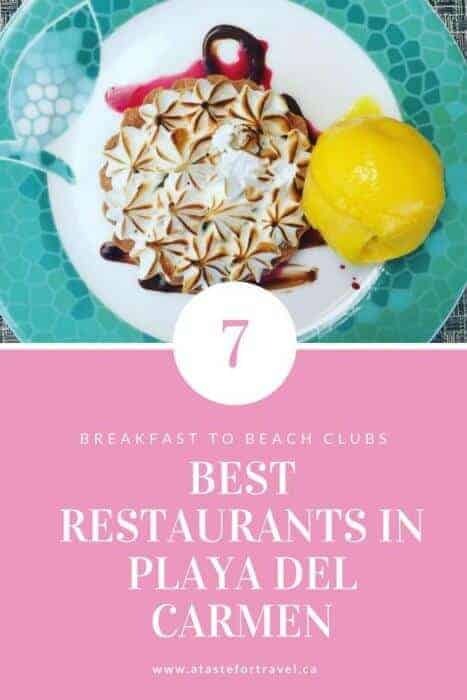 Eating breakfast out is one of the best things to do in Mexico if you love exploring traditional Mexican cuisine such as platano con crema (fried plantain with cream), chilaquiles and huevos rancheros in all their classic glory. At La Cueva del Chango, in a rainforest-inspired setting on Calle 38 Nte just steps off Quina Avenida, you get a delicious traditional breakfast with the added bonus of beginning your morning surrounded by ferns, a gurgling creek and a leafy canopy which makes it an especially relaxing way to begin your day. You can’t go wrong with any one of their breakfast mains which include classics such as huevos rancheros served with black beans a la olla and tortillas de maize. La Cueva del Chango is also the place to try Huevos Motuleños or Yucatan-style eggs which is a fried eggs on a crispy tortilla layered with black beans smothered in salsa and topped with grated Gouda, peas and strips of ham. 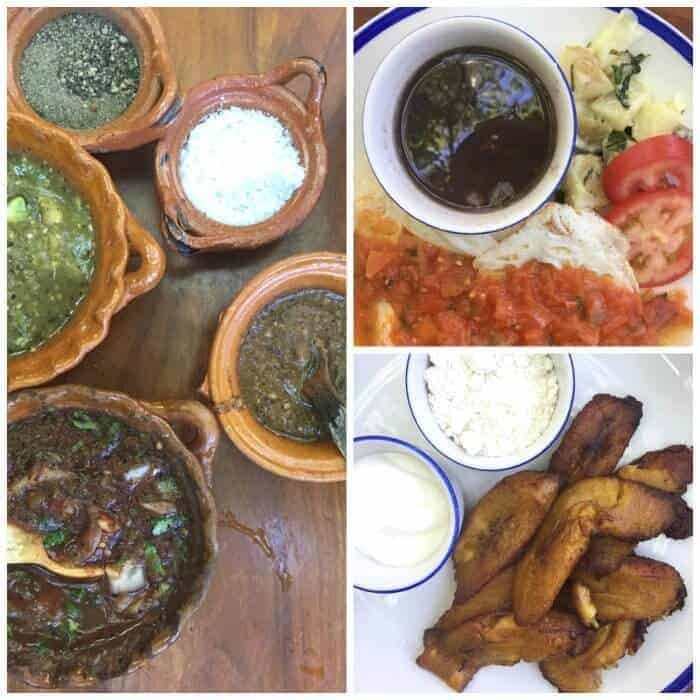 Other breakfast dishes well worth trying include molletes, caramelized crepes stacked with local ingredients like chaya (a leafy spinach-like vegetable), nopal (cactus), the fiery xcatic chile and more. Don’t miss the beautifully caramelized plantain. 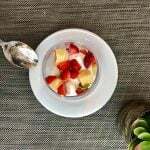 A main dish at breakfast costs between 90-98 MXN pesos which is around $5 USD. 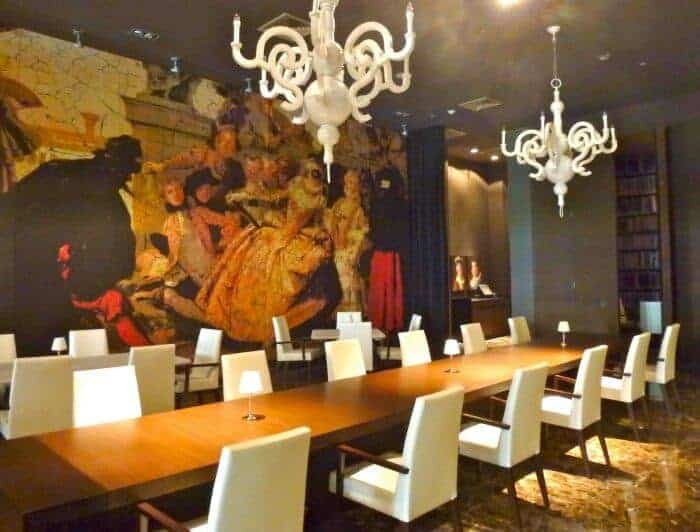 Passion by Martin Berasategui, a dining experience under the direction of the Spanish celebrity chef Martin Berasategui, has given Playa del Carmen has a whole new identity – culinary mecca. The acclaimed chef’s venture is located within Paradisus, a luxury all-inclusive resort at the end of 5th in Playa del Carmen’s northern edge. Known for his innovative Basque cuisine Berasategui earned his first Michelin star in 1993 and is highly regarded among globe-trotting food fans. Passion by Martin Berastegui features a tasting menu intended to complement the resort’s philosophy of inspiration for the five senses. The restaurant décor is sensual, bold and modern–much like the food. Berastagui’s award-winning cuisine is known for being at the leading edge of new culinary techniques and is acknowledged as among the world’s best in gastronomic experiences. Food fans will recognize signature Berasategui dishes – such as oysters imaginatively finished with apple and lemongrass or passion fruit panacota with lemon sorbet and shiso crushed ice. Guests have the choice of wine pairings with wines such as Piedra del Sol and Emeve from Mexico’s Baja wine country, as noteworthy highlights. Don’t miss trying this restaurant. It’s not just one of the best restaurants in Playa del Carmen, but ranks as one of Mexico’s best. Another worthy all-inclusive resort ideal for foodies is El Dorado Royale Playa Paraiso also in Playa del Carmen. 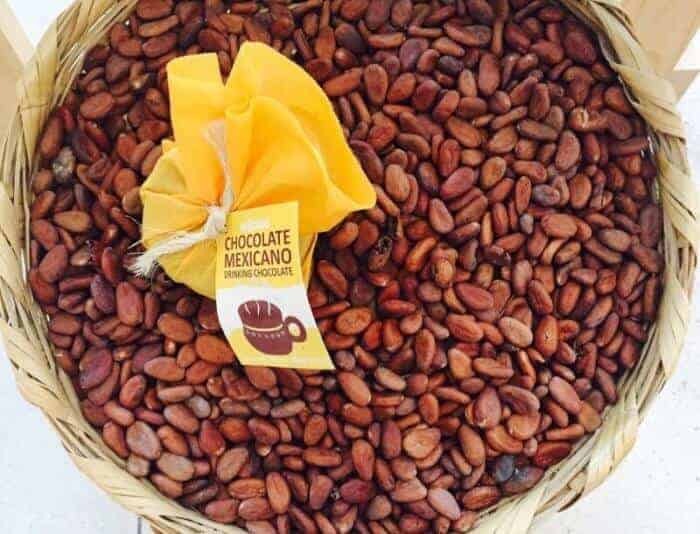 I’m a big fan of chocolate and Ah Cacao chocolate cafe was my go-to place for chocolate. Their iced chocolate was rich with just a hint of bitterness, it was the perfect pick-me up after a day at the beach. You can even order it with low-fat milk. There are several locations in town and you can often score a table indoors and bask in air-conditioned comfort while they whip up your iced chocolate. 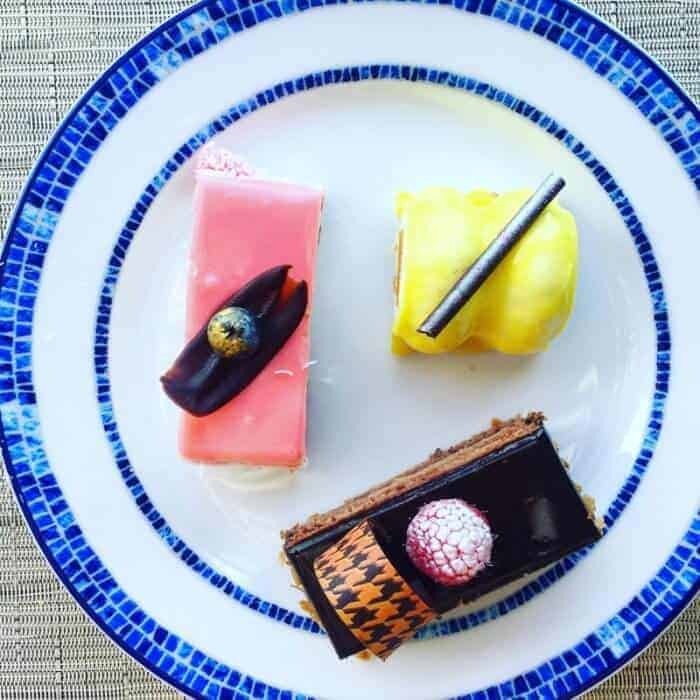 Another twist on the dessert scene takes place at the region’s five-star all-inclusive resorts such as this beautiful lunchtime dessert finale from Grand Velas shown below. Wow! Arduous research indeed! All of the food looks and sounds delicious. My mouth is watering (and I just finished lunch). Your post makes me want to go to Playa del Carmen right now! Warm breezes fruity cocktails and all that delicious food. Bookmarking for our next visit. We enjoyed our time at both Kool and Ah Cacao, Michele. Will have to go back & try the rest of the places on your list, Michele. 6 and 7 look and sound the most appealing to me! 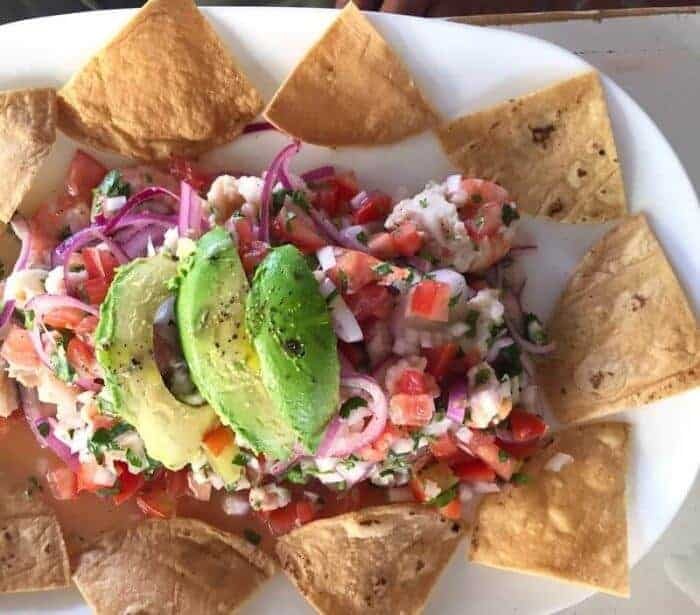 The ceviche at el Guero in Playa del Carmen looks amazing. One of my favorite things when I’m in Mexico. I was just in Mexico, in Loreto, need to consider Mexico as more of a destination shot since I live in California, food looks delicious! So many delicious choices, I would love to visit this corner of Mexico some day, I’ve only been to Mexico City and would love to visit this region.